Arctic cruise adventure holiday. Helping Dreamers Do. 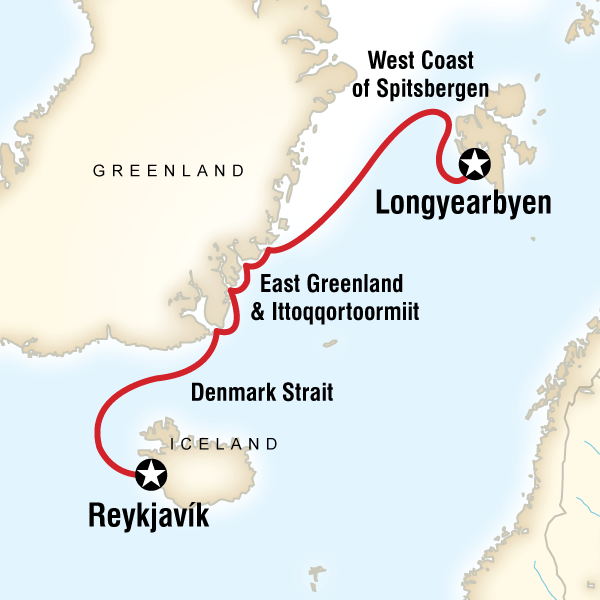 This fantastic 16 day adventure holiday, aboard the M/S Expedition Arctic cruise ship, will take you from Spitsbergen to Greenland around the fjords and ice edge in an attempt to get closer to the remote landscapes where wildlife on land and in the ocean provide an array of unforgettable experiences. The journey southwards reveals opportunities to spot whales, visit Inuit settlements and explore on foot and via Zodiac craft as you embark on an Arctic cruise adventure holiday over the course of two weeks that will eventually lead to the centre of fire & ice, Reykjavík, Iceland. As a leader in Sustainable Tourism, we are committed to ensuring that all of our marine expeditions operate in a socially and environmentally responsible manner. All expeditions aboard the ship meet and exceed all environmental regulations and protocols in the regions that we visit. At the end of every M/S Expedition departure, we raffle our Captain’s Sea Chart together with expedition books signed by the staff, the flag from the bow of the ship and many other items as souvenirs of the voyage. All proceeds are then donated through Planeterra to support the Bear Health project and the Save the Albatross campaign. Developed to address the health and wellbeing of polar bears due to the threats of global warming and pollution, the project aims to identify the effects of exposure to pollutants and climate change on the health of polar bears, and to compile the results in order to perform a total health assessment of polar bear populations in the Svalbard region. Our donation of £5,000 covered the cost of on-ship lab analyses of 50 Polar bears and funded the field work of one PhD student. The ship operates on marine gas oil, which is cleaner than truck diesel fuel as it offers lower sulfur dioxide emissions. 4-Stroke Outboard Engines In an effort to drastically reduce environmental pollutants 4-stroke outboard engines have been installed on all of our zodiacs. Our 4-stroke outboard motors produce less noise pollution and have engines similar to those of an automobile. Since there is no mixing of oil and gas the exhaust is intrinsically much cleaner and friendlier to the environment. We provide battery chargers and rechargeable batteries on the ship for use by our travellers as a way to decrease the consumption of batteries and their harmful effects on the environment. In an attempt to reduce the amount of dioxins released into the environment through paper production, the ship has been stocked with recycled, non-chlorine bleached paper and toilet paper. Through our commitment to responsible tourism we have developed the Planeterra Foundation, a non-profit organization that supports local community projects and international charities around the world. Certain items sold in the ship’s gift shop have been made by local communities in South America. By purchasing these items you will be directly supporting these artisans and proceeds also go to the Planeterra Foundation’s community project fund. difficult to see how that will change anything. Extremely well organised. All concerned - the ship's crew, the catering staff, and the leaders were all very friendly and efficient. Lectures and tips from the staff help us to understand conservation support ship engines looks able to reduce environmental impact small income for people of Scoresby sund. The holiday was great throughout but the highlight has to be seeing our first polar bear with 2 cubs! The scenery was also spectacular. Take a range of clothes for all temperatures. I did not expect it to be high 20s 200 miles north of the Arctic circle! but I wasn't complaining! All efforts were made to reduce environmental impact.